As General Tommy Franks, who commanded the US forces when they first entered Iraq more than four years ago, declared, "We don't do body counts'. Unfortunately, that's part of the ongoing problem; While the United States is showing disdain for counting the Iraqi dead, they are more than aware of the continually rising numbers. Our refusal to count the Iraqi dead, especially those by U.S. operations, demostates why there’s been a sharp erosion of support for Americans among the general populous. It's also goes a long way to explain why we find ourselves involved in yet another war quagmire. We may not count Iraqi civilians deaths, but they do. Every child that took a stray bullet from a U.S. gun, every bombing that was meant for us but took their family members instead, and every intentional killing by whatever side because of our occupation has etched a mark on the Iraqi population's hearts and minds. They've come to see our war as one of foreign military occupation and intervention that is destroying the Iraqi community and taking their lives. Poverty in Iraq has worsened acutely during our invasion and occupation. Those who were already surviving on the margins due to years of deprivation have sunk further, and the children of these families have recourse to no nutrition, no health care, no education, no present, and no future. They have lost friends, family, homes, education, health, and spirit. Many are now living on the streets, turning to crime or getting involved in fighting itself. But they still know how to count. Next time you hear how 'the surge' is already making Iraq safer, remember this…yesterday in Iraq: At least 46 killed in another bloody day of U.S. occupation in Baghdad elsewhere 32 "extremists", 10 policemen killed in Fallujah armed clashes. 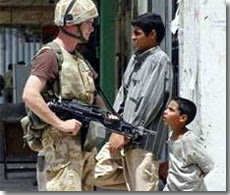 Not much has changed for civilians in Iraq. We fool only ourselves with the success of the 'surge' in Iraq. 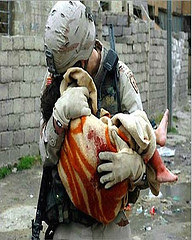 While we’re staying closer to our super bases, and posting more guards… Iraqis are still dying! Where’s the Iraqi freedom in our policy? Or doesn't that count? In Vienna I met a man from Palestein. He expressed that he couldn't understand why Americans didn't count the dead Palasteinias and Iraqs teh same as the do Americans and Israilis. I had no good answer. Who Speaks For the Abused Children?